The Panasonic AW-HS50 sub-compact, multi-format live HD/SD switcher offers 10-bit processing, four HD/SD-SDI inputs and one HD DVI-D input, as well as a built-in MultiViewer, Chroma Keyer, Aux Bus, 1080/29.94PsF support, and more. 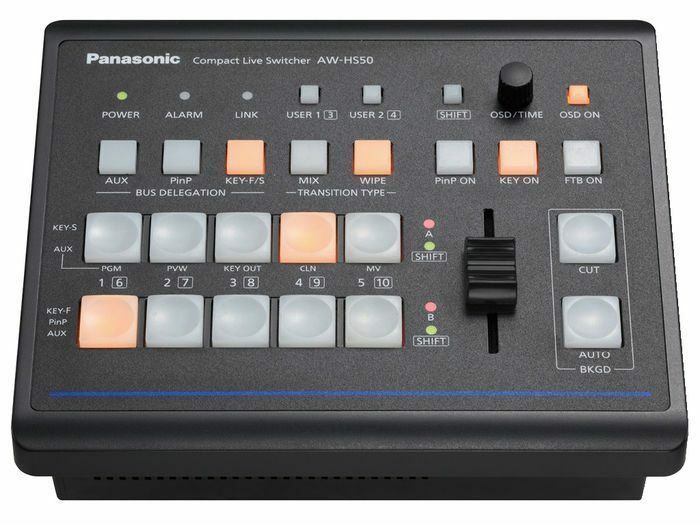 Panasonic AW-HS50 Ideal for mobile production, AV facilities, event video and more, the half-rack width HS50’s built-in MultiViewer allows users to view four, nine, or 10 images on a single display – significantly reducing the cost, size, and weight of a complete HD production system. The adjustable MultiViewer outputs can also be used to provide a multi-image large-screen presentation display. Other advanced functions include dedicated hardware for picture-in-picture (PinP) with dissolve transitions, switchable upconversion, color correction, a chroma/linear keyer plus a downstream keyer (DSK), auto or manual video transitions, wipe and PinP preset memories, and frame memories. As a key component in Panasonic’s first complete Internet Protocol (IP) production system, the HS50E also offers an IP link to the new AW-RP50 remote camera controller. 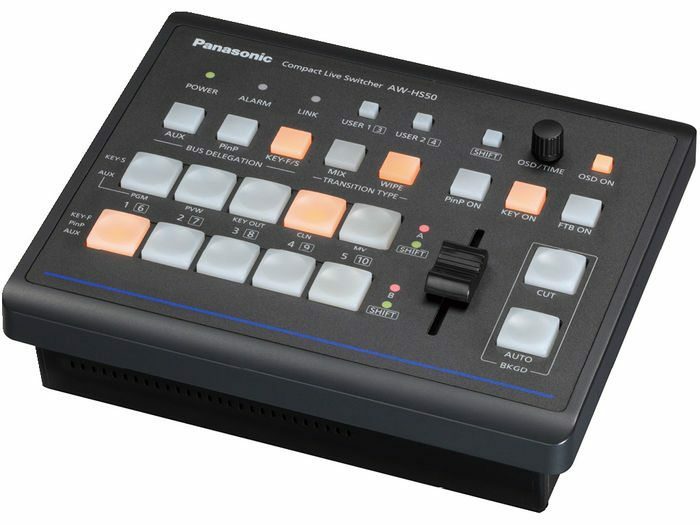 This link enables remote switching of the remote controlled camera video on the HS50’s AUX bus, and other unique functions The Panasonic AW-HS50 has built-in, switchable 10-bit frame synchronizers on each input, ensuring reliable, glitch-free switching even with non-synchronous sources such as remote camera feeds, small camcorders, and computer graphics. The Panasonic AW-HS50 has four HD/SD-SDI inputs and one HD DVI-D input, two HD/SD-SDI outputs and one scalable DVI-D output. Additional standard features include an on-screen display (OSD) for viewing switcher settings, GPI input, camera tally outputs, an Ethernet control interface, 4-pin XLR 12VDC input, and an AUX Bus for a versatile production workflow. 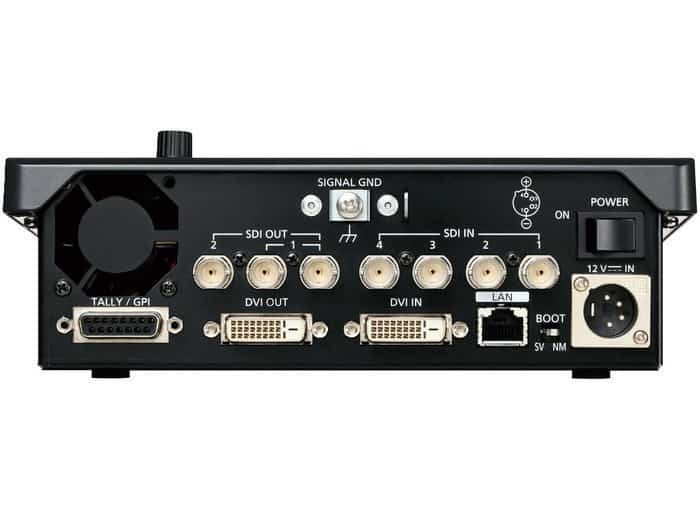 Standard features include 5 inputs (4 HD/SD-SDI, 1 DVI-D) and 3 outputs (2 HD/SD-SDI, 1 DVI-D). The built-in MultiViewer can display up to ten image windows at one time on a single monitor, including program, preview, inputs, and more! Cut and Mix transitions are available through AUX bus and PinP bus. Frame Synchronizer is embedded in all inputs. This enables asynchronous video signals to be switched without glitches. • Color Correction on SDI Inputs (SDI-IN1 to 4) for convenient matching of video sources. • 13 wipe patterns, plus PinP, Chroma/Linear Key, Aux Bus.